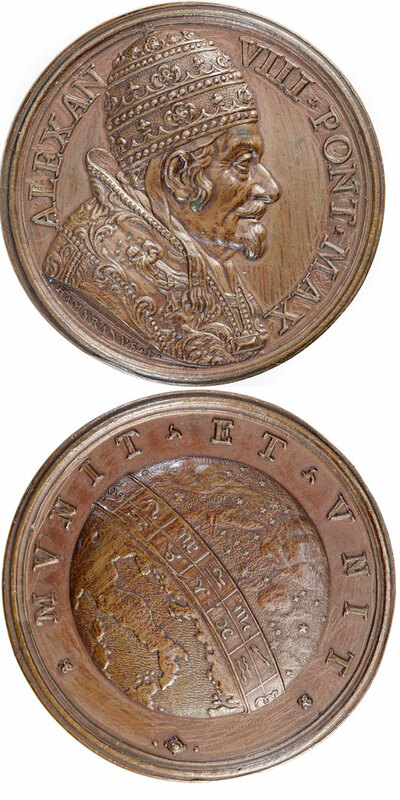 Obverse: Pope Alexander VIII wearing tiara facing right. Reverse: A band containing astrological signs encircles a globe of the earth; in the upper portion of the globe, the heavens; below, the peninsula of Italy and the Dalmatian coast. The globe represents the idealistic scope of Alexander VIII's papal charge. According to the inscription, MUNIT ET UNIT, he is to protect and unify the world. The band falls across the Balkans then being keenly contested with Turkish forces. Indeed, Belgrade would fall to the Turks in the first year of Alexander's reign. 38mm bronze, light on patina but dies are in really nice shape. By Giovanni Hamerani.